Running — they don’t call me “Marathon Man” for nothing! Web Design — need an awesome website? or a mobile app? Spectator sports — baseball, football, girl-watching, etc. Here’s a short story I wrote back in 1989. The setting is a baseball stadium prior to the start of a game. He wasn’t there. Even though he could hear the ball whiz past him and feel the chill in the evening air, he wasn’t there. It flew by repeatedly, with increasing velocity. The person responsible for that, Scott Baddon, was probably the most celebrated pitcher in the league, and a sure Hall of Famer. His admirers were leaning over the railing to watch the master warm up. They were all kids, maybe twenty or thirty of them at this point. All were standing. They were little kids and big kids, black ones and white ones, excited ones and more excited ones. You could see it in their eyes. They weren’t speaking much–only murmuring an occasional “Heads up” when balls from batting practice strayed into the area. Maybe they were in awe, or maybe they were daydreaming of playing in the Big Leagues themselves. The quiet was apparently just fine with Baddon, who had a serious look on his clean-shaven, boyish face as he kicked his foot to throw again. He was within arms reach of the kids. The ball travelled a path parallel to the railing, a mere three feet away. Every few moments it sped by, towards an all but ignorred warm up catcher, and then it returned in a slower, more arcing flight. Practically the whole group was in a hypnotic daze, watching the ball fly back and forth. But he wasn’t there. Physically, he was shoulder to shoulder with the others at the rail, but he felt as if he was far above them, in the upper deck of the stadium, concentrating not on the ball or on Baddon, but on these kids themselves. He could see the same scene through each of their eyes’ and wondered if he could feel the same thoughts going through each of their minds. But the more he concentrated, he found that indeed he was one of them, and these were his thoughts! He was older, but no more wise than they were. He wasn’t more of a realist. He really wasn’t much different at all. He knew that at age 32 he had seen more years than most of them, but at this moment they were all equal. He wanted to say something to Baddon, or to the silent kid with the baseball glove right next to him, or to the group as a whole. He said nothing. He knew that it was unnecessary, since they were already sharing an important ritual. Meanwhile, more and more of the field was being consumed by shadows and the chill of the evening breeze caused the kids–big and small, black and white, excited and more excited; to zip up their jackets a bit more. But not him. The cold felt good. It kept him from falling back into a trance and again drifting to the upper deck, which people were just starting to populate. He’d sit up there once the game started, shich would be soon enough. For now, he was one of the twenty or thirty kids, with no worries, no fears, and no strong desire to do anything else right now, except watch Baddon perform. Others in the ballpark were watching their own individual favorites or just trying to pick out the players by number as they nonchalantly fielded balls, while scattered across the field. After all, the teams needed to be loose for the game, which was now just minutes from starting. A five year old fan pointed to every ball hit in the air, so his grinning dad wouldn’t miss any. An older man behind the home dugout encouraged the fielders, but so quietly that he couldn’t be heard two rows away. Two teenage boys down the right field line shouted insults at the visiting team until they turned their attention to an attractive girl wearing quite a short skirt for such a cool evening. Someone in the mezzanine was belting out “Take Me Out to the Ballgame” between gulps from a thermos which obviously had something strong in it. With the seats now filling quickly, the vendors were already in mid-game form, offerring beer, hot dogs, and other delicacies to fans who must have been fasting all day. All of these people had come to escape reality for a few hours, to be with others like themselves, who wanted to release some of the tensions built up over the past few weeks of life. It was alright to act silly. They would take delight in seeing two outfielders collide. They would laugh when one of the ground crew dropped his rake. They would stand up on their toes to watch a fight in section 22. They’d cheer when one of their own would reach up and catch a ball fouled into the stands. And they would scream so loudly that few would have a voice the next morning. He thought about all this as Baddon’s last toss whizzed by. And a smile came to his face. He knew that he would enthusiastically join in all of the spectators’ activities. That’s why he was here. But although he smiled, he was starting to feel a little empty; a touch sad on the inside. Batting practice was over and the daydreaming would give way to focusssing on the contest itself. It would become harder to relate to the players once their game faces were on. No more autographs. No more joking with fans. No more lazy throws. Moments, before, the bright green grass had been in brilliant contrast with the fire orange box seats. But now the sun was setting, and the splendor was also gone, as there were now only small patches of orange amid a sea of assorted colors. No longer were fans interacting with players. Now it would be teams playing before a crowd. As he watched Baddon walk towards the dugout, he felt a sense of loss, as if an invisible barrier was being erected between himself and the players. Others must have felt the same way, because they were hurrying towards their seats in different parts of the stadium. He was alone at the railing, stubbornly fighting the barrier’s formation, somberly watching the rest of the players clear the field, and feeling the magic drift away in the cold breeze. He stared across the grass one last timne, and was just starting to turn from the railing when hi glimpsed the last player strolling past, twenty feed away. It was Barry Marcus, the star center fielder, and Marcus was gazing directly into his face. Suddenly the background noise was gone. The breeze died down. The smell of hot dogs went away. He was frozen in place and felt uneasy. Marcus seemed to be reading his mind and sharing the same feelings. Both men knew it. Marcus smiled and the barrier shattered. “Enjoy the game,” Marcus said, and turned his head toward the dugout, starting to jog. The spell lasted for a moment, and then the noise, the breeze, the smells; all returned. He left the railing and started to move up the steps, grateful for finally being able to stretch his legs. It was a long walk to his seat in the upper level and he was going against a heavy flow of fans who were still arriving. He looked into their faces and saw the anticipation in their eyes. It promised to be a good game, but all he kept thinking was that they had missed the best part. 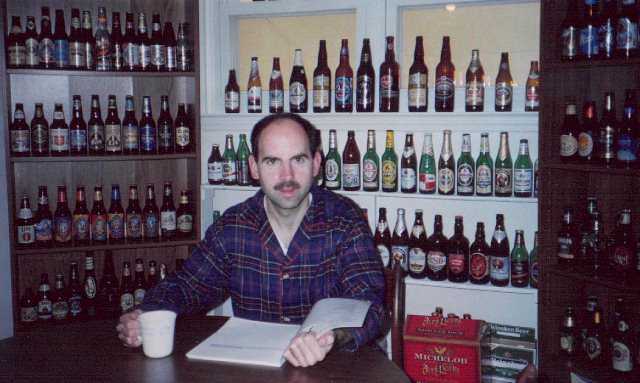 Lounging in my “Beer Room” around 1996 —smile, Ray!! Just as beer goes hand-in-hand with baseball on a hot, sunny afternoon, it also goes a long way towards explaining the behavior of seamen in port. As a Naval Officer, I experienced first-hand why grog is an essential item for sailors when away from the ship. Consumption of a few cold ones often leads to the stereotypical rowdy behavior of the boys when they know that they only have a night or two to get in a week’s worth of fun! My first fond memories of beer drinking involve laboring under a hot summer sun at “the farm”, my parents’ Catskill Mountains (NY) weekend and summer getaway place. There was always a project in progress–building a dam, installing a water pipe, toiling in the garden, fixing up the old barn, mowing the extensive lawn, etc. 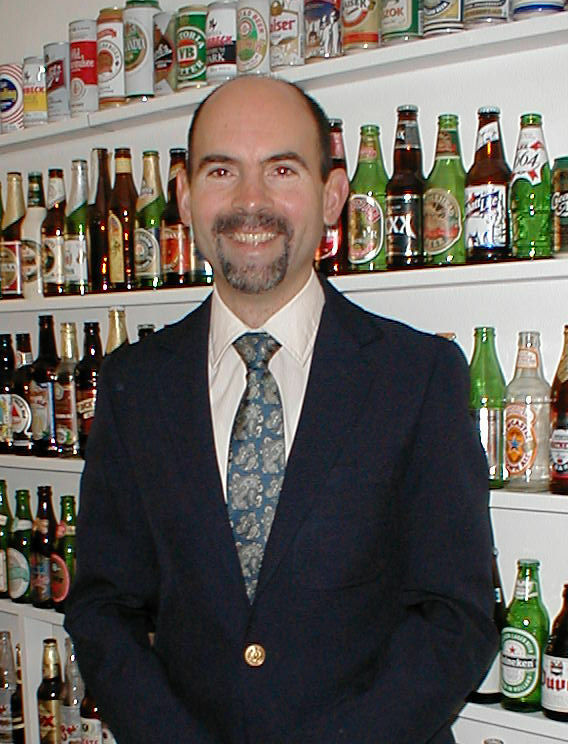 I was 8 or 10 and we’d frequently stop work for some iced tea, or better yet, a cold Gennesee or Genny Cream Ale. Dad would have half the bottle (in about three gulps) and then pass it around to me and my younger brothers. Now that is what I call a happy memory!